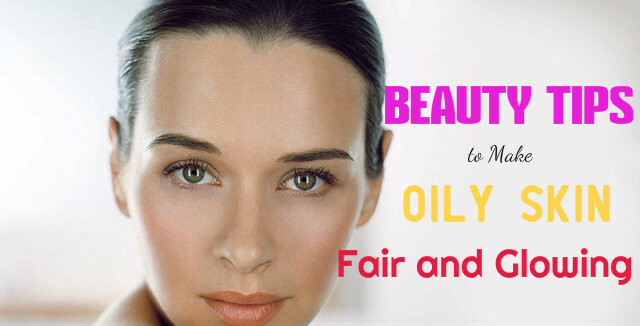 Oily skin is always prone to pimples and acne and it also gives your skin a shiny look. It is quite a difficult task to take care of oily skin. You cannot prevent oily skin, but you can control how much oily your skin gets. Below are given some beauty and makeup tips that you can try at home to get rid of oily skin. Apply tomato juice on your face with a cotton ball. This helps in reducing the pores by tightening them. Make sure that you use a foaming cleanser to cleanse your face. Apply it on your wet face and massage well with your fingers. Then wash well with water. It is better if the cleanser contains certain ingredients that can fight against bacteria that cause pimples. You can also use a medicated soap and lukewarm water to cleanse your face. Fruits like papaya and watermelon are natural cleansers and amazing for your skin. Rub them gently on your skin and this will cleanse your skin naturally and helps you get rid of greasiness. Drink at least 8 to 10 glasses of water or more daily. Have lots of fruits and vegetables every day. These help in removing all toxins from your body. Multani mitti is great for treating oily skin. Mix multani mitti with rose water and use this as a face pack for oily skin. This is of great benefit in summers, when your skin sweats a lot and becomes more oily. Multani mitti absorbs the oil from the skin and rose water works as a natural astringent. It is important that you moisturize oily skin too. Choose a moisturizer that does not make your skin feel greasy. If your favorite moisturizer is a bit oily, then you can add a little water or rose water to it and apply on your face. If there are any spots or pimples on your skin even after cleansing, scrubbing, toning and moisturizing, then apply an anti-pimple lotion over your pimples and leave it on. If there are any marks left by acne, apply an anti-blemish ointment on the scars and leave it overnight. Orange peel can help control oil secretion as it contains astringent oils. Dry orange peels and grind them tom get the powder. Mix the powder with rose water and make a paste. Apply it on your face and wash after 15 minutes. This is also good for reducing blackheads and blemishes. It is a good idea to scrub your face twice a week. This helps in removing the dirt that is present in the pores and prevents breakouts. Apply the scrub and gently massage with your fingers. Then you can wash off with water. Since oily skin is prone to acne, be careful and use a scrub that is very mild, so that it does not hurt your skin. Masoor dal is a good natural scrub for oily skin. It has the power to absorb all extra oil that is present on your skin. If you have lots of pimples and scars on your face, use a good cream with serum. This helps in treating pimples and also prevents further breakout of pimples. Toner helps in removing excess oil from your skin and also maintains the pH balance of the skin. If the toner you use leave your skin dry, then you have to change it and get a suitable one. Rub an ice cube on your face before makeup. This will allow the makeup to stay for a longer time on your face. Wash your face frequently so that no dirt collects in the pores of the skin, thus causing a breakout of acne. Use a face wash that is formulated for oily skin. Use a product that will help you control and fight acne. Immediately after you cleanse your face, it is important that you apply a toner on your face. You can use an astringent and this will help you to control the secretion of oil. Use natural astringent like orange peels. These work best for oily skin. Do not use too much of concealer because it makes your makeup crease. With oily skin, creasing effect is caused very fast. Using blotting makeup sheets throughout the day can help absorb the excess oil that is present on your skin. It is also good for keeping your skin fresh. Before you apply makeup on your face, it is important that you cleanse your face. You can use natural and foaming cleansers as they are best for removing excess oil from the skin. Use a primer that is suitable for oily skin. Apply it on your face as well as on your eyelids. Before you go to bed, cleanse you face and remove all traces of makeup from your face. If any makeup is left on your face, it can increase the secretions of oil and make your face look oilier. So, follow the tips given above and keep your skin fresh and healthy looking.